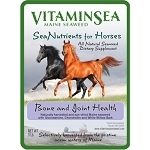 For animals, seaweed is a rich source of micro-nutrients, amino acids, and trace elements. Because the minerals are in plant tissue, they are easily digested and assimilated by animals. Many of the trace minerals found in seaweed are essential for producing enzymes, which in turn promotes healthy body functions. These elements and minerals are often lacking in land-grown feeds and pastures (due to erosion or leaching), and standard mineral mixes. Recommended by leading animal care and holistic professionals, seaweed is an organic product that improves overall health, performance, and well-being in animals. 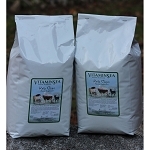 Our VitaminSea Pet Products are finely milled for easier digestibility, while the VitaminSea Farm Kelp Chips is a larger milled product. Larger animals prefer this mill, as it provides a “crunch” when consumed. We follow strict quality control guidelines for our feed-grade seaweed. It is carefully selected from the outer islands, dried in greenhouses, and milled separately from out fertilizer grade seaweed.